History has been made by many names within the realm, by many colorful characters. Some of these figures are still with us, some have been slain in battle, while others have simply departed for distant lands, never to be seen or heard of again. One of these names that has helped shape the face of the realm, arguably as much as anyone else, is Test. Test has been a diplomat for and Marshal of the Destiny league for years, guiding them through turbulent times, numerous Beacon Wars and various other events that would have seen lesser leagues bruised, battered, and utterly destroyed. 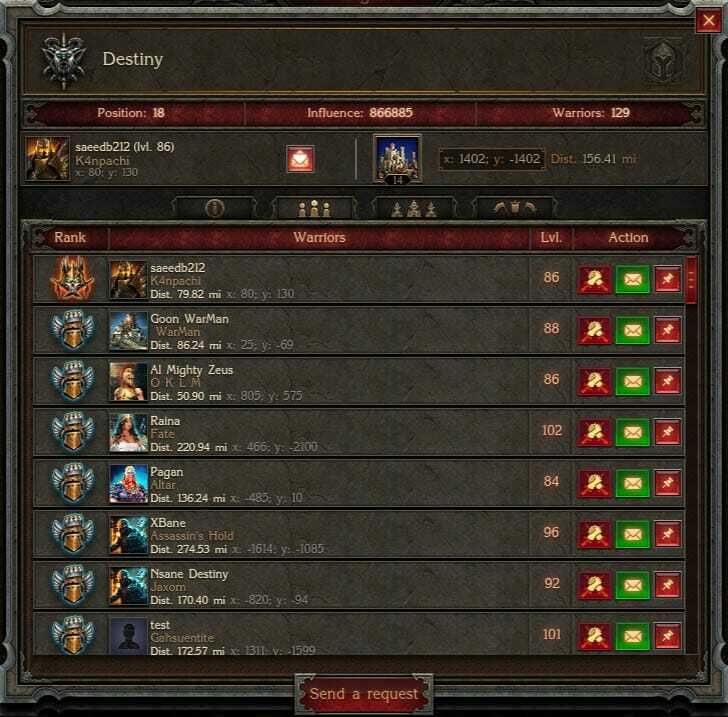 The most recent of these events is Destiny's war with the mighty Emperors, a league that has given them a run for their money like never before seen. Yet, through the guidance of Test, Destiny has survived, despite their many setbacks. Now, a new age has dawned, and Test has decided to pass on the mantle of leadership to a new face, one that will hopefully have the required renewed vigor that is necessary to keep any league going in these dangerous and challenging times. 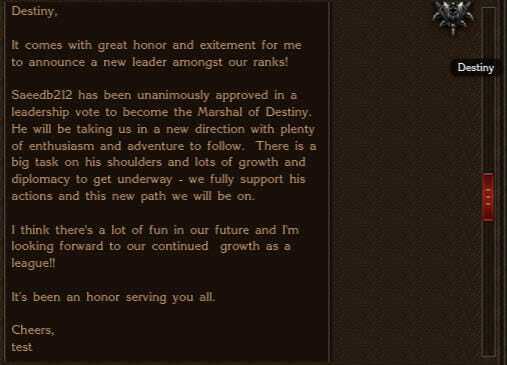 Announcing the following to his league, Test crowned the new leader of Destiny. As can be seen through the league roster, the above message can be confirmed and verified. Test has stepped down, but is not departing his leadership role entirely, as he has remained on as a Captain of Destiny. Quick to send out his praise and thanks, Saeed, the new Marshal of Destiny acted quickly and sent out the following message to his new Bannerman, making it clear that he plans on being an active, engaged leader. Yet war remains a constant hardship that all members of Destiny must contend with, as they remain in constant conflict with the Emperors. They also battle the Emperors’ closest allies, such as the Ratcoms, who have recently found themselves a target due to their role in the takedown of one of Destiny's beacons. For now, we wish Saeed the best of luck in his new role, and are sure that Destiny itself will continue to prosper as a powerful and important league in an ever-changing landscape. A Day of Love Or Hate?